University of Liverpool academics have discovered what may be the remains of a 4,500 year old ramp system to transport the huge alabaster blocks used in the construction of Egypt's Great Pyramids. 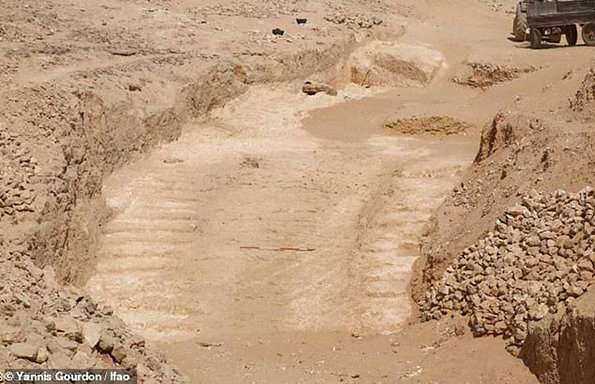 The ancient ramp was discovered at the site of Hatnub by researchers from the University's Department of Archaeology, Classics and Egyptology (ACE) and the French Institute for Oriental Archaeology in Cairo. Egyptologist, Dr. Roland Enmarch said: "The Hatnub quarries were the most prestigious source for Egyptian alabaster, the milky white banded stone which was much beloved of Egyptian civilisation. "Their importance today lies in the fact that they are archaeologically very well preserved. "The quarry preserves large numbers of inscriptions left by ancient quarrying expeditions from 4500-4000 years ago. These enable us to better understand the personnel and logistics of organising expeditions to these desert quarry sites. "Equally remarkably, the archaeological context of the quarries is very well preserved. "They sit in a broad landscape of Bronze Age structures related to stone extraction and transport: huts for sleeping and stone working, pathfinding cairns, ancient footpaths, and even simple dry-stone religious structures. The quarries are connected to the Nile by one of the best-preserved Bronze Age roads in Egypt. "In our most recent season, we discovered an extremely well preserved ramp leading up out of the quarry, with traces of post holes that will enable us to reconstruct in more detail the ancient technologies of stone haulage and extraction. "Since this ramp dates to the reign of Khufu (builder of the Great Pyramid at Giza, one of the Seven Wonders of the World), our research offers the exciting possibility for offering further insights into the logistics and technologies used in constructing that astonishing building." Yannis Gourdon, from the French Institute for Oriental Archaeology in Cairo, said: "This system is composed of a central ramp flanked by two staircases with numerous post holes. "Using a sled which carried a stone block and was attached with ropes to these wooden posts, ancient Egyptians were able to pull up the alabaster blocks out of the quarry on very steep slopes of 20 percent or more." 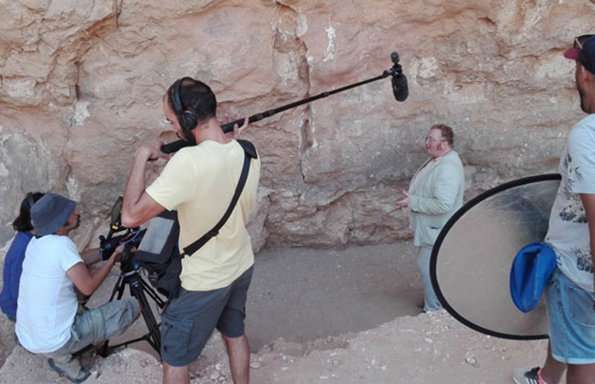 Dr. Roland Enmarch added: "Our joint Anglo-French mission to Hatnub aims to study all of these features of the site, in order to produce a more fully rounded picture of how quarrying worked in Ancient Egypt, and what it meant for the people involved." Ridiculous to believe that the engineers who designed and built the Egyptian structures could not have come up with the wheel. Perhaps they didn't need them? Ancient records also report that the Pyramids were built in total silence.